You can easily crop and edit photos in your iPhone and iPad. These devices provide a number of basic photo editing photos options including markups, brightness, contrast, filters and rotation of pictures. Learn how to make such changes in your favorite pictures. If silence speaks louder than words, a picture is worth a thousand words. Though all of us like to click pictures, not all of us are professionals to edit them. But nowadays you don’t really need to be a pro to edit photos. Thanks to most smartphones that allows you to edit pictures clicked by your phone camera. iPhone and iPad are no exceptions. You can crop and edit photos right within your Apple device. You might have clicked a beautiful landscape, however, while clicking you might have missed something that you should not have ignored. It may be the man with the ice cream cone at the far right corner looking straight into your camera lens! Relax! There is no need to panic. If you have clicked the picture using your iPhone or the iPad, you can get rid of any portion of photos from your beautiful landscape. Just “crop” it off! In this article, we will show you how to crop and edit the photos on your iPhone or iPad. Though we are fond of clicking photos, most of us do not frame every photo perfectly when we shoot it. Apple provides editing tools in the Photos app that lets you crop, straighten, rotate, and change the aspect ratio of your pictures with ease. 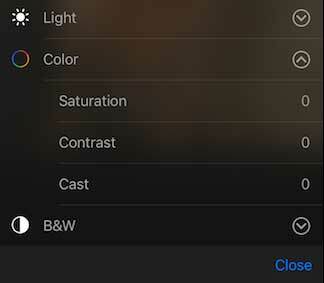 Steps to edit a photo and the options are the same on the iPhone and iPad but the menu options may differ a bit. Locate the photo that you want to crop, tap to open it. Tap the Edit button, along the bottom of your screen as displayed in the illustration below. Tap on the Crop button and drag the corners of the photo until you get the perfect crop. Along with the cropping options, there are many other editing functions that you can use as explained in the subsequent section. The crop tool also allows you to rotate the photos or drag the corners inward. 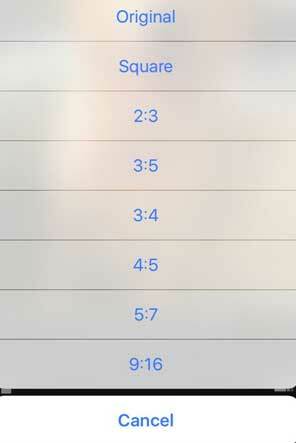 At the bottom-left corner, there is another option that allows you to rotate your photo in 45-degree increments. If you think you need to constrain your crop to a specific aspect ratio, tap the aspect ratio button at the bottom-right corner as illustrated above, and the Photos app will present you with a list of standard ratios. You can select any of these ratios and your photo will automatically be cropped to that ratio. Note: If iPhone’s Photos app will detect red eye effect in the photo, a red eye reduction button will also appear among the options. In addition to the simple crop and rotate controls, you may also want to try out the filter presets. If you are not satisfied with the changes, you can always undo the changes by tapping the Cancel button. You can use the lighting, color adjustments, and the manual controls to select the preset effects or you can use it to adjust the preset values. To perform fine-grained edits, you can click the icon at the top right corner depicted by the three lines. It will display the color selector options as illustrated below. Selecting any of the available options allows you to make very specific edits to the photo’s Saturation, Contrast, and Cast options. You can make similar edits with B&W and Light options as well. When you are through editing the pictures, tap the Done button. If you are not pleased with your photo editing, tap Cancel to discard the changes made. If you are not satisfied with any of the changes made using the various edit options, tap Revert to return to the original picture. You can tap the Markup button at the bottom right corner to markup your photos with drawings, text, and magnifications. Not happy with the changes? Again tap Cancel to discard the changes. The Photos app of iPhone/iPad helps to edit the photos clicked by your phone camera and on your phone. Therefore, do not compare it with the full-fledged photo editors that we use on our PCs. iPhone clicks very good photos and you may not need to make many adjustments. However, if you think a photo needs a bit of polishing; the editing tool is more than ideal for those small tweaks. Last updated: 2 May 2017 | Published on: 2 May 2017 | Authored and Edited by: Lalit Kumar and Team | Filed as: Home » Apple » iPhone » How to Crop and Edit Photos on the iPhone or iPad?